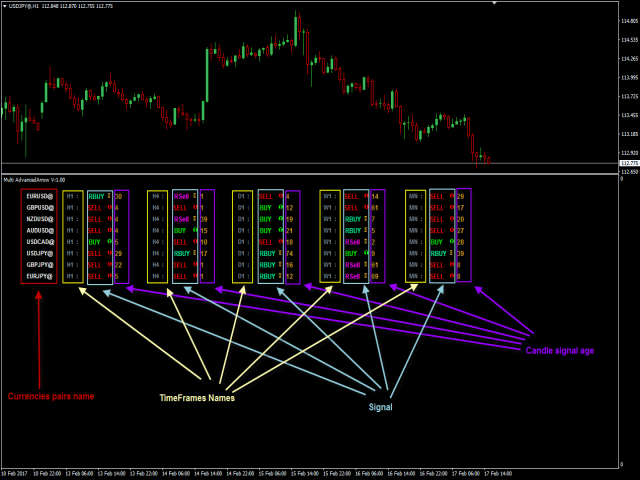 It is the same of Advanced Arrow indicator but shows the signal of 8 currencies pairs at the same time on 5 Timeframes without any TPs line or SL. You will know when exactly you should enter the market. This indicator does not repaint it's signals. You can use this indicator on any timeframes but i recommend you to use it on H1, H4 frames. The indicator gives you four signals (Ready to Buy "RBuy", Ready to Sell "RSell", Buy, Sell). When RBuy appear you should be ready to enter Buy trade and waiting for Buy appear to enter Buy order. When RSell appear you should be ready to enter Sell trade and waiting for Sell appear to enter Sell order. Also the indicator show you the number of Candle which signal appear on it. so whenever the number of signal candle is small it will be successful trade. 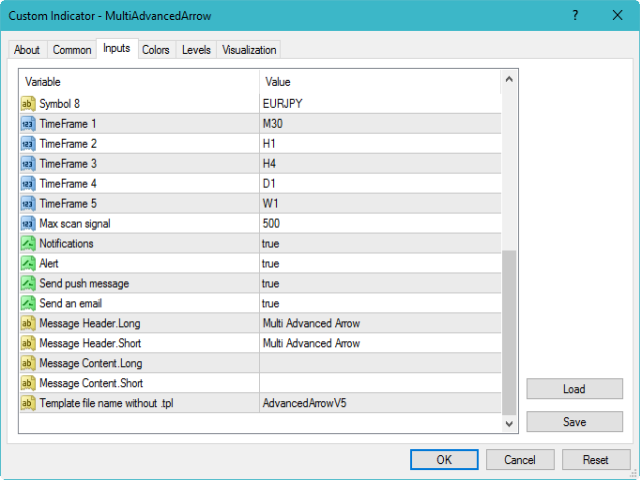 Currency: It works on any currency pair you choose in input parameter. It depends on the time frame you use. TimeFrames Color - The color of TimeFrames names. 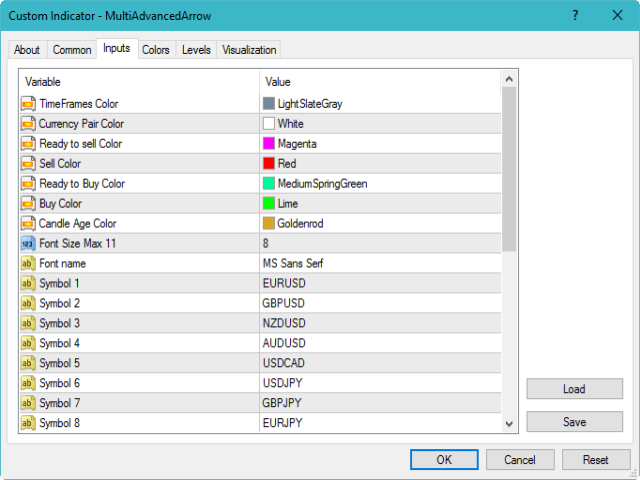 Currency Pair Color - The color of Currency Pair names. Ready to Sell Color - The color of ready to Sell signal (RSell). Sell Color - The color of Sell signal (Sell). Ready to Buy Color - The color of ready to Buy signal (RBuy). Buy Color - The color of Buy signal (Buy). Candle Age color - The color of Candle Age. Font Size - Font size of all text in the indicator. Font name - Type any kind in Font to change all text in the indicator. Symbol 1 - The name of first currency pair. Symbol 2 - The name of second currency pair. Symbol 3 - The name of third currency pair. Symbol 4 - The name of fourth currency pair. Symbol 5 - The name of fifth currency pair. Symbol 6 - The name of sixth currency pair. Symbol 7 - The name of seventh currency pair. Symbol 8 - The name of eighth currency pair. Timeframe 1 - The first TimeFrame. Timeframe 2 - The second TimeFrame. Timeframe 3 - The third TimeFrame. Timeframe 4 - The fourth TimeFrame. Timeframe 5 - The fifth TimeFrame. 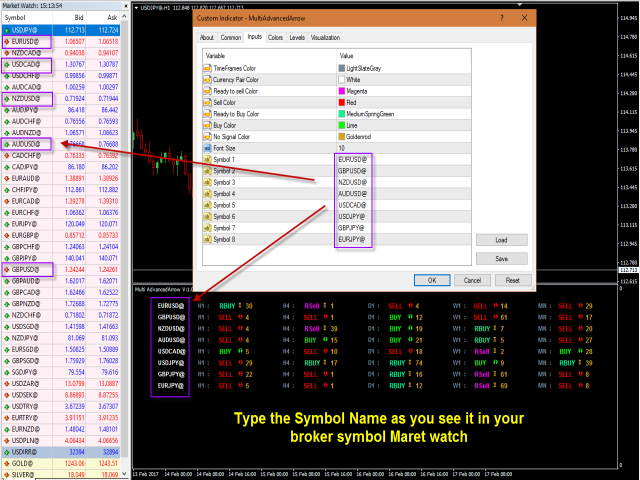 Max scan signal - Indicator will only show Buy/Sell signals up to last "assign number" bars. Notifications - (True / False) enable or Disable notifications system at all. Alert - Displays a message in a separate window. Send push message - Sends push notifications to the mobile, whose MetaQuotes IDs are specified in the "Notifications" tab. Send an email - Sends an email at the address specified in the settings window of the "Email" tab. Message Header.Long - The header of message send to you in long signal case. Message Header.Short - The header of message send to you in short signal case. Message Content.Long - The message content send to you in long signal case. Message Content.Short - The message content send to you in short signal case. Template file name without .tpl - Type template file name that will be assign on chart will open when clicked on any Time frame, but file name must be without (.tpl). 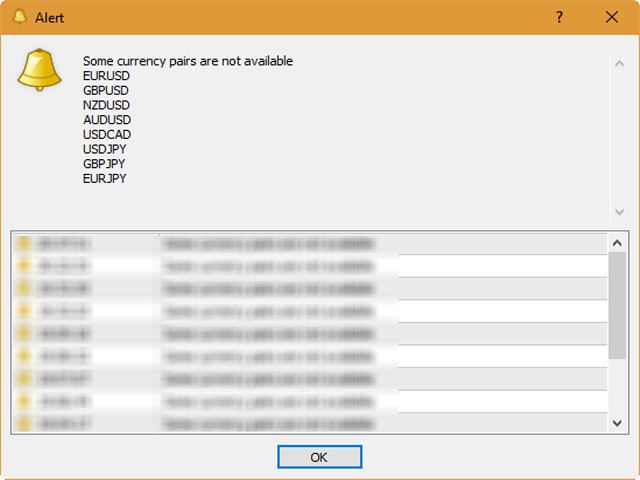 If you want to work on just one or two Currency pair you can leave others null. When you type the symbol name in input parameters you have to enter it as it is. Ex: if EUR/USD appears to you (EURUSD@, EURUSDM, EURUSD...) you must type it as it is appears to you. If you did not, it will not work. Like the fifth picture on the screen shots. Excellent indicator...no having to have tons of charts open to watch for signals from the AA. 1. Fix 'FontSize' Parameter issue. 2. Add new input parameter "Font Name". 3. 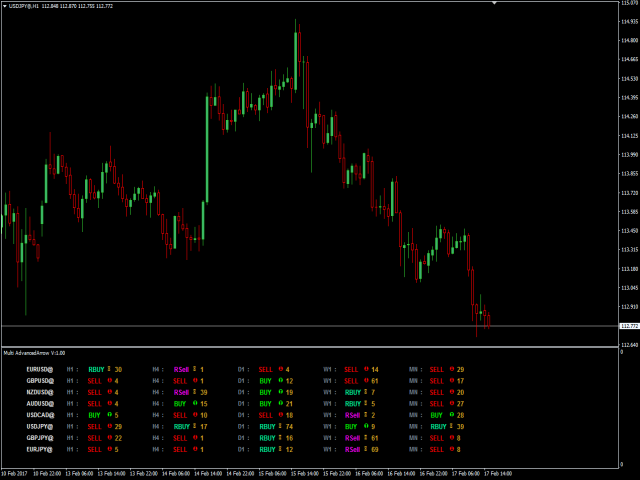 Add new input parameter called "Max scan signal", it will valid for all timeframes and pairs. 4. New choice in Time frame list called 'None'. 5. Add sign behind currency pair name has at least one signal age "1" in any timeframes. 6. Add notification System for new signals. 7. Add ability to be able to click the time and asset 'box' in the multi panel that will open up the chart.